oh boy two of my favorite things! Oh no Waffles!!!! We don't want you to get eaten! Don't worry, Waffles, it is some wacky human idea that probably won't last. Ooooh Waffles - chickens are not nice at all. Did you know they eat mousies? Whole? They do! We don't like the thought of this at all. We like our Waffles - undiluted! MOL! Oh no, this is not good. Waffles, break out of that bag and run. Hmm...we don't know about those chips... Purrsonally, we thinks salmon chips sound better! We hopes nobody eats yous, Waffles!! Waffles , I can tell who can eat you is the witch !....RUN !!!!! Hey Waffles, that chips looks delicious, I would like to taste it! I don't think this new product is going to sell at all. 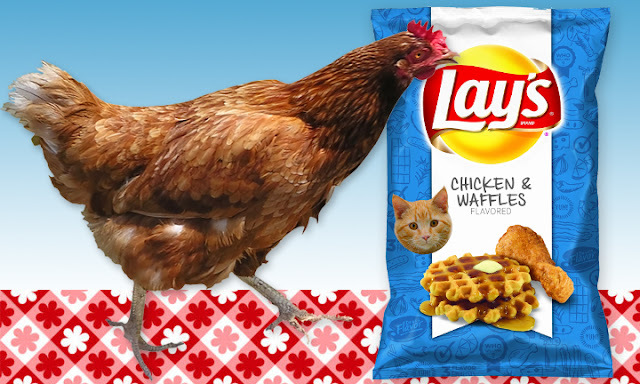 We like chicken and we like waffles, but a combination? No thanks! MOL, that is scary, on so many levels.. I know you're getting big, but that chicken in the photo looks pretty large, too, Waffles. Better look out! Chicken licking good we say! Have a wonderful Wednesday. Haha! 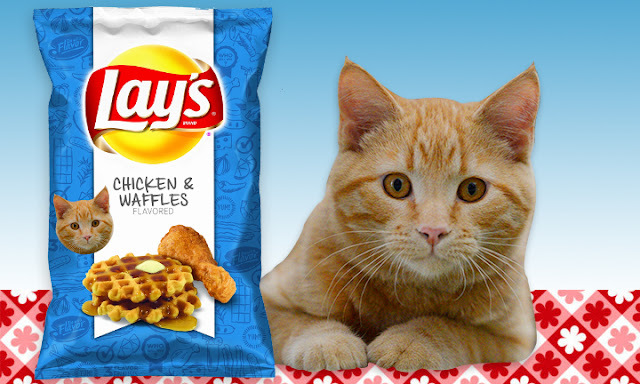 The mom saw these Lays chips advertised yesterday and thought immediately of you, Waffles! Let's hope it's not a live chicken in there with you!! it's a test, W2 - if you can take on the chicken, you can take on Katie. Be strong, Grasshopper. Too funny!!! You know what? We BOUGHT those chips last weekend to try them and they really ARE good! You mostly taste maple syrup...they taste like Waffles (sorry!!) but we couldn't taste the fried chicken. Waffles watch out for that BEAK! They are NASTY! LOL!!! We think chicken is tasty, though not from a bag. 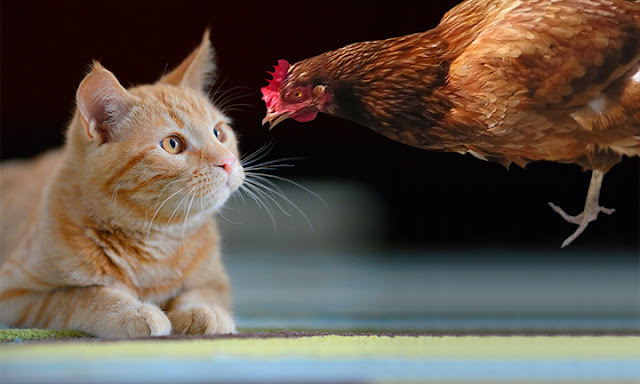 . .
hey Waffles Too, just a warning... chickens, left to their own devices, have been known to peck a tuft of fur from the top of your head. I had to wear a comb-over for weeks to hide the bald spot. So better wear your space helmet just to be safe. Well it might be the next big thing! Oh noes... poor chicken, she turns cookie!!! We've heard of chicken and waffles, but we say that chicken and Waffles Too should be kept far away from each other. We hope you get out of that bag soon, pal! Waffles Too, we think you're sweet and adorable but the thought of Waffles and Chicken makes us want to hork a hairball!! It is definitely time to get Waffles on the payroll. Katie can handle cash. wink wink There is so much talent under one roof over there it is mind-boggling. I'm not sure what to say, Waffles, other than beware of syrup. Make sure there isn't an iron around either, Waffles!! Lays should NOT expect us to be ordering these new chips any time soon. Heh heh! Ewww, those chips sound disgusting! We like Waffles the cat beter! Somebody needs to let the cat out of the bag. Stay away from the chicken! Hugs & belly rubs! Maybe Katie had something to do with this. If you get eaten, she won't have to put up with you any more. We love chicken! Christine feeds us tropical grilled chicken and go a little crazy. Do you like chicken Waffles?